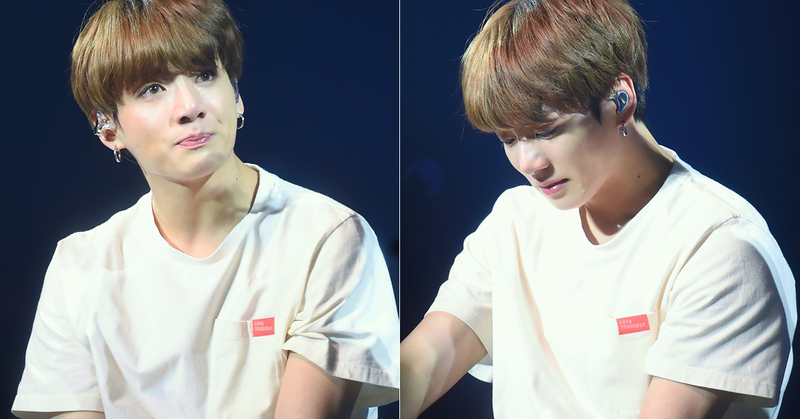 BTS Jungkook Eventually Cried Bitterly "This Will Never Happen Again"
The group BTS' member Jungkook performed world tour 'LOVE YOURSELF' in London without choreography because of a heel injury and during the concert, Jungkook eventually cried bitterly. On October 10, BitHit Entertainment announced, "Today, an issue has occurred that may affect the performance of Jungkook, who was scheduled to appear 'LOVE YOURSELF' concert in London. According to BigHit Entertainment, after he finished rehearsal and sound check, Jungkook suffered an injury to his heel, while he was lightly stretching in the waiting room. Then, "The medical team said it is not a serious injury but performing choreography may further aggravate the injury such as bleeding so he should avoid choreography" and "Jungkook will attend the concert but he will sit on the chair and perform without choreography so his injury does not aggravate"
Eventually, on the stage, Jungkook could not show the BTS' distinctive perfectly organized group dance but proceeded the concert by singing. At the end of the concert, Jungkook said, "I actually prepared a comment in English, but an incident suddenly occurred so I will speak in Korean to talk about this sincerely" and "I was looking forward to this concert a lot and stood up on the stage. Thank you so much for making us so happy on the stage and the situation like today will never happen again". After global fans heard Jungkook's sincere comment, they cheered "It's okay" "It's okay" in Korean and Jungkook cried bitterly at last because of fans' sincere consolation. 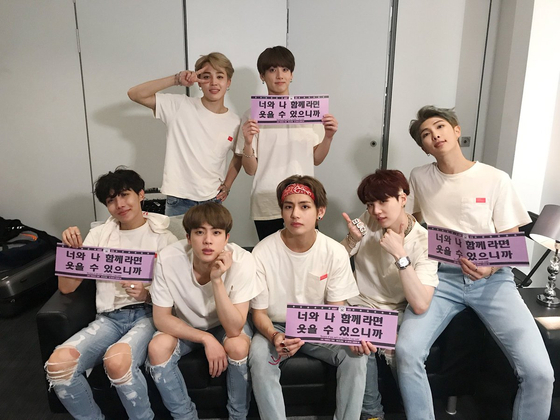 BTS who successfully finalized North America tour at the New York Citi Field on October 6, will continue the 'LOVE YOURSELF' Europe tour from October 9 to 10(local time) at the O2 Arena in London and move on to Amsterdam in the Netherlands, Berlin in Germany and Paris in France. Ladies and gentlemen, we are sorry to announce that an issue has occurred that may affect the performance of one of the members of BTS, Jungkook scheduled to appear tonight. Approximately two hours ago following the rehearsal and sound check, Jungkook was lightly stretching in the waiting room when he collided with floor furnishings and suffered an injury to his heel. Medical staff immediately responded and performed the necessary treatment. the opinion of the medical team is that while the injury is not serious, performing choreography may do further damage to the injured area. Following the advice of the medical staff, Jungkook will take part in the performance tonight but remain seated without choreography. We sincerely apologize to all of our fans who have been eagerly awaiting tonight's performance. And we hope you would understand our circumstances.